Hi guys. 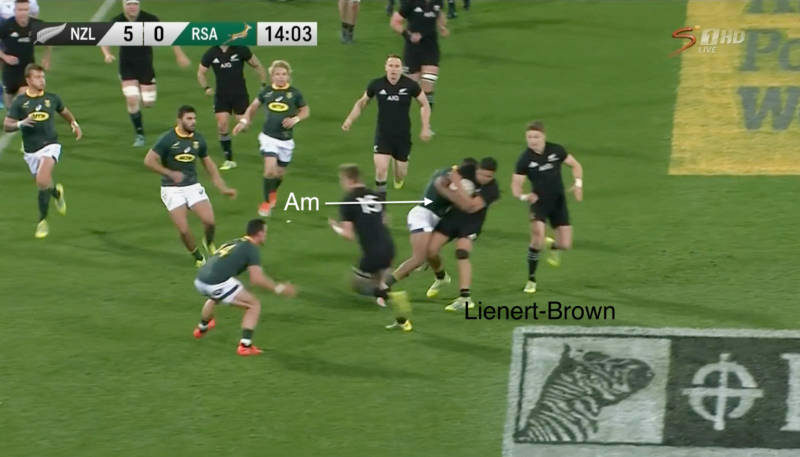 Now that the dust have settled after the big clash in Wellington and our wives has hopefully forgiven us for shouting and dancing so much in front of the guests, I wanted to take a closer look at the match and specifically how the Springbok approach to the All Black breakdown contributed to their victory. For many people there is a debate over whether you must contest your opponent’s ball or not. I have my own opinion, but if we take a look at what the Boks did then we will get some interesting insights. Above we see Taylor being taken to ground with du Toit in a good position to try for a slow or a steal. Instead, du Toit will leave the ball alone and recycle to his left. Many coaches will feel that this is a mistake and that we must take every opportunity to slow down our opponent because quick ball is so deadly. 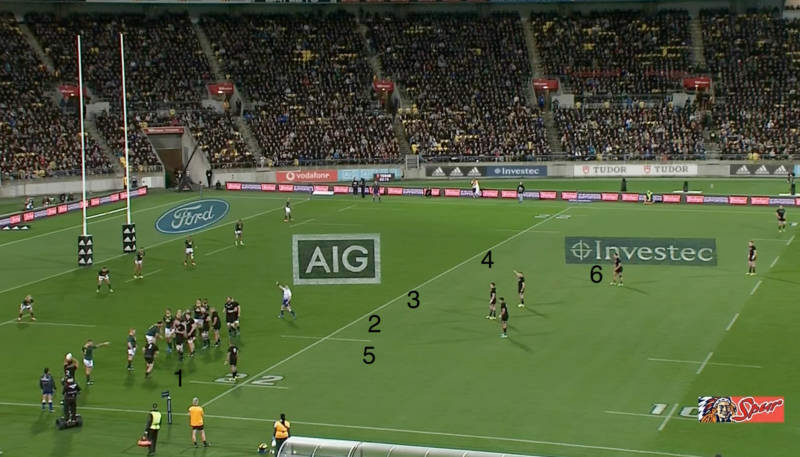 The All Blacks play out with lightning ball to their right. What we see above is the very next moment. 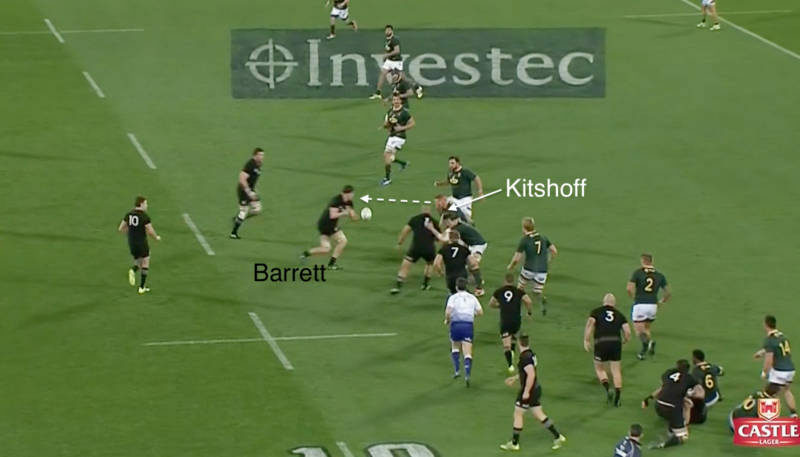 Crotty get the ball from Barrett, but before he can do anything he is wrapped up by the Bok midfield defence and the All Black options is killed in the cradle. The Boks was able to do this because they had enough numbers to be aggressive. You can not be direct in defence or employ quick linespeed if you do not have enough defenders. 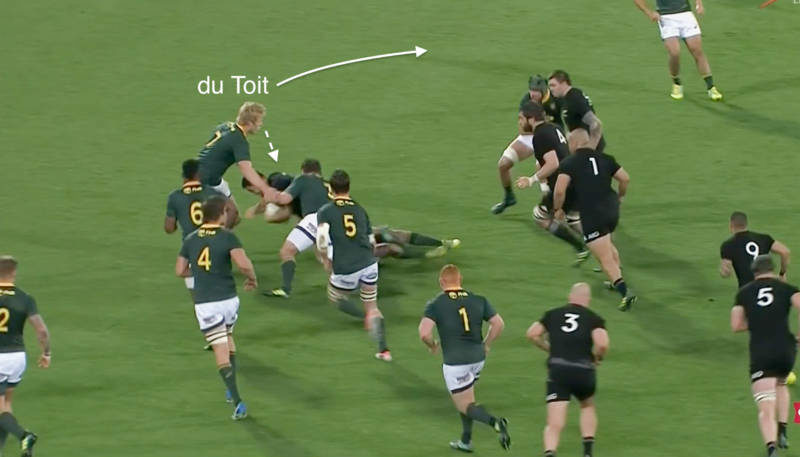 By ignoring the breakdown, du Toit joined the line and gave his outside men the ability to attack New Zealand. Have a look at the picture above. After a lineout New Zealand will go through six phases and end up far behind where they started. Each breakdown is marked from 1 – 6 and we can see how they either being met at the advantage line or getting caught behind it. My friends at Rugby Analytics tell us that the All Blacks had 156 rucks against us, but that we only contested 25 of them. Rassie want his defenders on their feet and ready to shoot. It was something that the All Blacks was not used to and did not like. Above we see the excellent Lukhanyo Am make a read on the centre Lienert-Brown. Am shoot up out of the line and make a big spot tackle before the All Black options can take shape. We saw evidence of how uncomfortable this approach make the All Blacks by their uncharacteristic mistakes and often pointless kicks. And I believe one reason they became so narrow towards the end of the match when they needed to score was because they did not trust themself as much as they normally would. Another advantage of not contesting at breakdowns was that we could use our extra men to frustrate New Zealand in other ways. One of their favourite methods to put you on the back foot is the “Pigs” call. This is when their forwards attack and make small “tip” passes to each other. 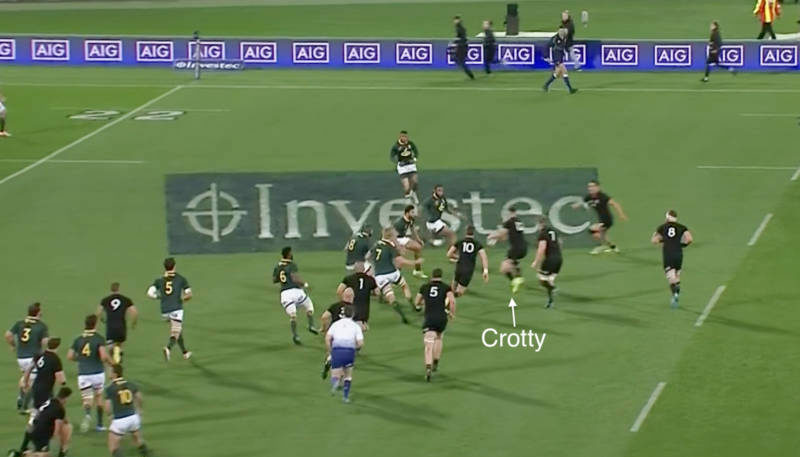 It is normally quite devastating and in many ways it is the All Blacks “go to” play when they stuck, but the Boks was tactically ready for this and regularly hit the tip receiver back. Above we see the lock Barrett receive a quick tip pass, but Kitshoff know it is coming and smash him. Again we see how the Boks numbers allowed them to do this. Firstly I do not believe this is necessarily a “default” approach. We actually saw the Boks sometimes going for a steal or a slow against the All Blacks and it may be that it purely depend on how good the opposition is at protecting their ball. The All Blacks are very good, so therefore we contest less. Maybe against a different opposition there is more opportunities to attack the breakdowns and then we will do that. And we must not forget the presence of Louw and Van Staden in the group which show that the Boks still want the option to go that way if they want to. Another thing is that we wonder how sustainable this style of play can be. For it to be successful your defence must be very physical. You can not just make tackles, you must make dominant tackles so that your defenders can rush forward. Otherwise they are continually jogging back and they have no linespeed. Rugby Analytics tell us tell us that 107 of the Boks’ 220 tackles was double tackles (again, using that extra defenders) and that 59% of all their tackles was dominant. So it is a absolute physical battle, but we wonder how often you can repeat that and if it will take a “toll” on the players. The Boks will also have to watch their discipline when they are this aggressive, as they gave away far too many penalties. It will be interesting to see how the Boks play against Australia this weekend and how we approach the breakdown. What I would like to see is the same aggression and proactive nature of our defence, but that our players still has the awareness to play to the ball when the opportunity arise. If we were defending the whole game – how we scored 36 points. It is physically impossible to score 5 tries without attacking. Defense is nothing new. Heineken defended v well. How many wins v NZ? You guys keep believing that and the Boks will keep losing. We have got attacking potential in this team. And a forward pack capable of dominate to give that go-forward ball. This is why the only decent coaches we’ve had were The Great One and Mallett – different mindset. They took the game to NZ instead of living off scraps. You really are that thick aren’t you… did you even bother to read this article or any of them for that matter? Do you strongly agree or just agree that The Messerschmitt-Willie Leroux is the oil that makes the backline engine run? It’s as evident ( if not more ) today than it was when it was blatantly apparent in Willie’s first match in the Subiaco Oval of Brisbane. At that time HM & other assorted Yahoos were thinking Zane Kirchner was even an option LM–F–AO. Time to look errr….panic regarding the future. Where to the next Messerschmitt to make the backline trains run on time? Should we look towards the backwater Griquas where Willie came from? Perhaps the shores of the Lake of Galilee? IDK. I just know that the Sunking is gonna split after the WC & SA backline is in a world of hurt unless they can snag another maestro FAST. I DO NOT see one on the horizon. Who do I blame? That’s right….ZeeBulls. They pilfer & ruin any talent they can & they gotta long reach. Lucky for Willie & SA he was too ” undersized ” to ruin. Of course Willie’s first one wasn’t Aus. It was in that western town of SA vs Scotland. He was just Sooooo triumpant in play that I mentioned the start in Aus. Still remember all the SA ” journalists ” going on about how it was so hard to win there because……blah blah blah history & such. Takes REAL LOSERS to push FAKE NEWS. Mr Oom Rugby always bring it ( Like BC when he interviewed ). This highlights how lucky & valiant the effort was against the snazzy NZ’ers in NZ. Too bad Rassie wasn’t coach in WC. HM is scared of his shadow – he’s perfect for France – they interpret it as arty or something. lol Americano – a fully switched-on meschersmidt putting everything on the line for his country is a force of nature on attack. On defense, and when he gooi’s his hands up in the air when the magic doesn’t happen, I get worried. Best they do considering this worst ranked Australian side in the history of the game has not won there since they defeated Snor’s side and yet again they have failed to win back the Mandela Cup.